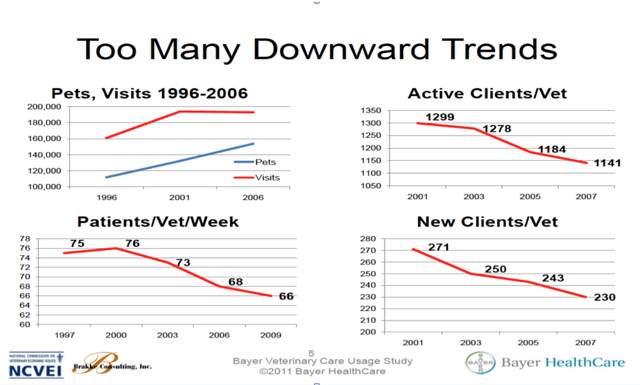 Veterinary visits are declining, and vets are seeing less pets. A lot of the blame in recent years went to the economy, but the decline in veterinary visits started before The Great Recession of 2008. You've likely heard about this again and again, and you've probably seen the data from the 2011 Bayer Veterinary Care Usage Study. But the real questions this blog seeks to answer are: If it's not just about the money, then why aren't pet owners coming in for routine care? And what can we do to increase those visits? Some recent research presented at the 2015 AVMA Economic Summit showed that veterinary prices, when corrected for inflation, have NOT grown significantly over the last 10 years, discrediting the idea that prices have up too far/too fast. The decline in visits isn't just about the money. Instead, consumers' “willingness to pay” hasn’t kept up with price increases. They aren't seeing value in preventative visits. “Because he needs his shots” is losing its effectiveness as a reason to bring a pet to the veterinarian. It is especially hard to for pet owners to see the value in veterinary visits when that pet seems perfectly healthy. What can we do to show pet owners the value of preventative veterinary care? I asked several of my friends and colleagues who are very successful practice owners, management consultants, or both what tools and tactics they are implementing right now in order to have a great year. These are highly successful veterinary professionals, such as Dr. Andy Roark and Karen Gavzer, who have “walked the talk.” They have extensive real-world experience solving the problems and challenges that face veterinary practices not just here in the States, but also worldwide. Interestingly, many of their recommendations had to do with improving year-round engagement. This makes sense, as remaining relevant year-round is perhaps the area where practices will face the greatest challenges in the future. How do these 7 veterinary business experts suggest we communicate to increase visits? 1) Customize communication so it's relevant to specific pets and their owners. If you can provide valuable information and targeted educational content to your clients, it’s never been easier to stand out. Clients have questions about their pet throughout the year. WHICH food is best for my geriatric poodle? WHAT are the top 3 things I can do to help my 8-year-old Lab live to be 14? You only have so much time with a client in an exam room….you can’t possibly cover it all! Turn to online tools, like veterinary apps, to share customized, relevant information with clients about their pet between visits. 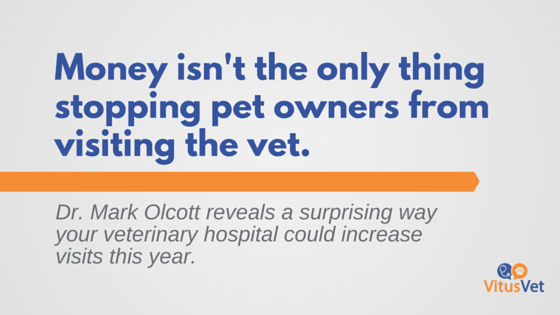 2) It's not just about your veterinary hospital. If the only time a client hears from you is when you want something from them (i.e. vaccines, dental, labwork, etc..) they will tune you out pretty fast. Get creative about ways you can interact with clients throughout the year when you aren't seeking something in return. Staying top-of-mind is worth it in the end. 3) Don't make these lazy mistakes. The good news is that you can still use email to communicate with your clients. The bad news is that if your practice is still rocking the spammy newsletter/reminder combo that hasn’t changed in 10 years, your clients are probably turning you off. If you doubt this, ask your newsletter provider for the open rate and click-through rate. If both of these numbers aren’t at least 20%, you’re wasting your money and destroying value. How are you "destroying value?" Because you’re training your clients that you are not a source of value and, instead, are doing the same old “interruption marketing” that is rapidly declining in effectiveness. In short, you’re getting lazy. Posting generic, boring content to your veterinary hospital's social media or using outdated pet portals can have the same negative effect on client's perception of you. 4) You don't just have to take my word for it! If you know it's time to update your year-round communication strategy, I have an epic resource for you. 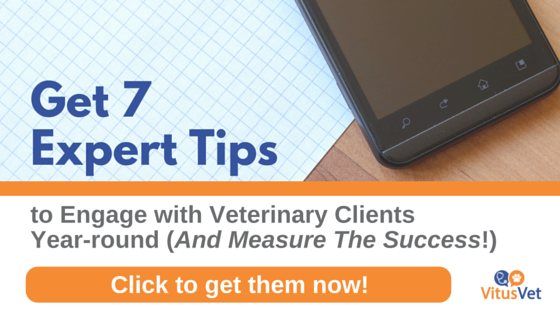 Thought leaders from the veterinary industry, like Dr. Andy Roark & Dr. Peter Weinstein, have contributed their BEST tips for communicating with clients, and they're compiled here in a FREE PDF, 7 Tips from 7 Experts. Click here to get the tips now, and enjoy putting them into action at your practice.